My feature on the blog about Araminta Campbell* described how I came by a roll of her bespoke designed tweed. I was delighted when tailor Alice Burkitt offered to make me a coat from this cloth. 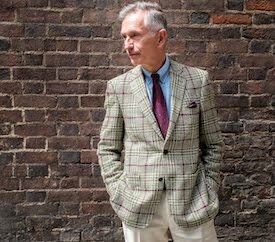 Over a few meetings, virtual and real, Alice and I decided on a tweed design that would be suitable for town or country. 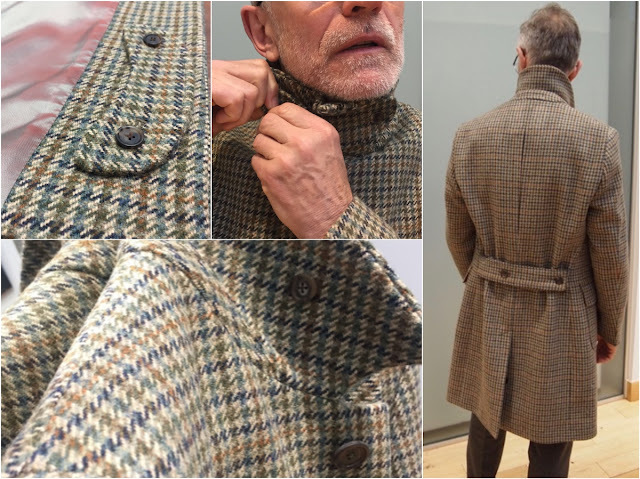 We envisaged a coat that would be crisply tailored, clean in shape, made of a comfortable, country-style tweed and wearable anywhere: for country dog walks or in town. I wanted a soft shoulder line (with no padding) and length to cover the thighs (coats are often made too short). As a topcoat rather than an overcoat, it would be slim fitting rather than voluminous. Over a couple of fittings the coat came together. 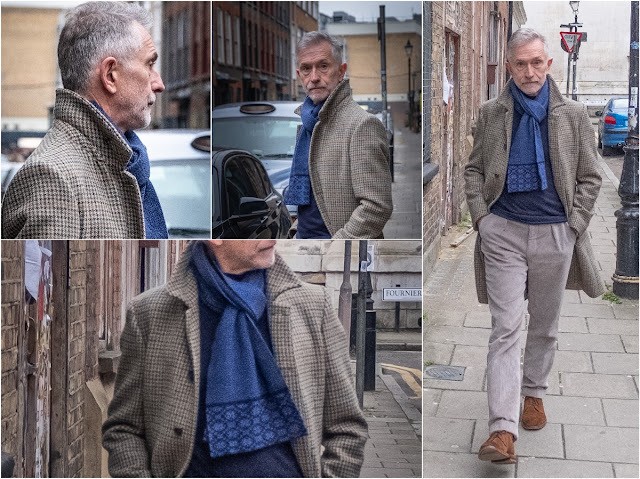 As ever, it's important to find a tailor who can help you the client find the style, cloth and image that you want, while guiding you on the technical aspects of the garment and offering suggestions as to what may or not work. Alice's approach exactly fits this ideal and I was very happy that the coat (see images above) reflected what I wanted. Tailoring, to me, is all about quality, provenance and personality. That is what drew me to the industry when I first set out and why I chose to start Alice Burkitt Tailoring. I studied tailoring and then menswear design at London College of Fashion, graduating with a first class honours degree. My final menswear collection celebrated 'men attracting the gaze', using real fur and feathers, (all by-products including roadkill) luxury fabrics and tailoring. While I was studying I also did some stints with exciting bespoke brands such as Timothy Everest and Ozwald Boateng. After graduating I went on to work at British heritage brands including Gieves & Hawkes and Burberry. Then on to freelance design for brands including Dashing Tweeds, a small luxury menswear brand who are fabric led and made in UK. 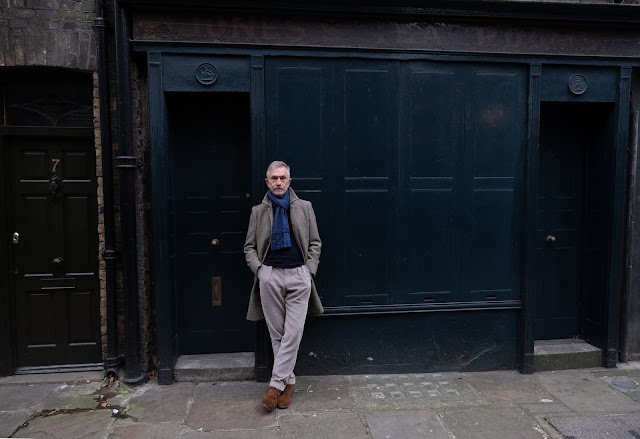 From there I moved on to work as a consultant, managing strategic projects to support the growth of the UK fashion manufacturing industry, which I continue to do now alongside building my made to measure menswear brand Alice Burkitt Tailoring. I now get to work with beautiful products every day and each customer brings a new design brief. My customers get to choose from the extensive collection of beautiful British cloths I have built. What I really love is working with people to help them create something that looks great and, most importantly, fits beautifully and makes them feel great. I am totally portable and can do fittings wherever it suits my clients (including home and office visits) but my two geographical focuses are Hertfordshire (near my home of Hitchin) and London. I currently have an established fitting event that I hold every six weeks in the Queens Room above Los Reyes a lovely tapas bar and restaurant in Hitchin. And I have spaces where I can host clients in Bloomsbury, Soho and Mayfair in London. I'm additionally planning a six weekly fitting event in London. I can be contacted through Alice Burkitt Tailoring. * My feature on Araminta Campbell is here. The coat's a cracker GF particularly the cloth, cloth pattern and detailing at the back. Also liking the pleated cords - could I ask where you acquired those? Thank you. I'm developing the trousers as "The Perfect Trousers" with Susannah Hall Tailor and we hope to collaboratively market them in Spring. The idea is that they are available in any cloth from tweed, flannel to cotton, linen and cord and will bridge the gap between slim-fits and vintage looser fits.